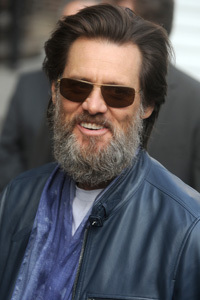 Check out Jim Carrey's latest look! Check out Jim Carrey’s latest look! Famed for his youthful looks and funny guy roles, Jim Carrey arrived at the Late Show With David Letterman looking slightly different this week! Sporting a huge greying beard and dark glasses, the 52 year old actor was almost unrecognisable. Shunning Hollywoods clean-cut look, we think Jim looked great showing off his new silver fox look.